Milprazon 12.5mg/125mg Tablets are for the treatment of mixed infections by adult cestodes and nematodes in dogs weighing at least 5kg. 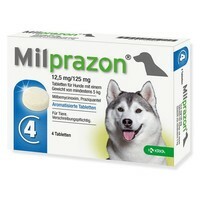 Milprazon Tablets can also be used in the prevention of heartworm disease if concomitant treatment against cestodes is indicated. Each tablet contains Milbemycin oxime 12.5mg and Praziquantel 125mg.